Hepatitis Monthly - Safety, Efficacy, and Tolerability of Sofosbuvir and Ribavirin in Management of Recurrent Hepatitis C Virus Genotype 4 After Living Donor Liver Transplant in Egypt: What Have We Learned so far? Safety, Efficacy, and Tolerability of Sofosbuvir and Ribavirin in Management of Recurrent Hepatitis C Virus Genotype 4 After Living Donor Liver Transplant in Egypt: What Have We Learned so far? To Cite: Dabbous H M, Montasser I F, Sakr M A, Refai R, Sayam M, et al. Safety, Efficacy, and Tolerability of Sofosbuvir and Ribavirin in Management of Recurrent Hepatitis C Virus Genotype 4 After Living Donor Liver Transplant in Egypt: What Have We Learned so far?, Hepat Mon. 2016 ; 16(5):e35339. doi: 10.5812/hepatmon.35339. Background: Recurrence of HCV after living donor liver transplant (LDLT) is nearly universal, with almost one third of recipients developing cirrhosis and graft failure within 5 years after LDLT. Different studies have been published on the effect of sofosbuvir after liver transplantation on recurrent HCV with different genotypes. Objectives: The aim of this study was to evaluate the efficacy, safety, and tolerability of sofosbuvir and ribavirin in LDLT recipients with recurrent HCV genotype 4. Patients and Methods: Thirty-nine Egyptian LDLT recipients were treated for recurrent HCV after LDLT with nucleos(t)ide analog NS5B polymerase inhibitor, sofosbuvir, and ribavirin without pegylated interferon for 6 months (November 2014 to June 2015) in this intention-to-treat analysis. Results: One recipient died 1 week after starting the treatment, but the remaining 38 patients completed 24 weeks of treatment and were then followed for 12 weeks after end of treatment (EOT). The sustained virological response (SVR) at week 12 after EOT was achieved in 76% (29/38) of recipients. SVR was significantly higher in treatment-naïve patients and in recipients with a low stage of fibrosis. Only 2 (5%) recipients developed severe pancytopenia and acute kidney injury. Conclusions: We recommend initiating treatment as soon as possible after liver transplantation with newer combinations, such as ledipasvir/sofosbuvir or sofosbuvir/simeprevir, rather than sofosbuvir with Ribavirin, to achieve higher rates of SVR. Hepatitis C virus (HCV)-related end-stage liver disease (ESLD) is the most common cause of living donor liver transplant (LDLT) in Egypt. Recurrence of HCV after LDLT is nearly universal (1), with almost one third of liver transplant recipients developing cirrhosis and graft failure within 5 years after LDLT (2). A few LDLT recipients may develop rapid fibrosis due to HCV recurrence within 1 year (3) or a severe form of recurrent fibrosing cholestatic hepatitis (FCH) early after transplant, necessitating urgent antiviral therapy (4). Many studies published in recent years have shown that antiviral treatment of post-transplant HCV hepatitis is the best option for improving the prognosis of these patients. Treatment with pegylated interferon and ribavirin has been associated with a low sustained virological response (SVR) rate, as well as poor tolerability in transplant recipients (5, 6). The first study assessing the safety and efficacy of an interferon-free regimen in HCV-infected liver transplant recipients used a combination of sofosbuvir and ribavirin for 24 weeks (7). Different studies have been published about the effect of sofosbuvir after liver transplantation on recurrent HCV with different genotypes (8). The aim the present study was to evaluate the efficacy, safety, and tolerability of sofosbuvir and ribavirin in LDLT recipients with recurrent HCV genotype 4. This was an intention-to-treat prospective analysis of consecutive patients from November 2014 to June 2015. Approval was obtained from the institutional review board of Ain Shams University, college of medicine, Cairo, Egypt. Thirty-nine LDLT recipients were treated for recurrent HCV for 6 months after LDLT with nucleos(t)ide analog NS5B polymerase inhibitor, sofosbuvir, and ribavirin without pegylated interferon. All patients had HCV genotype 4. The recipients were either treatment-naïve or non-responders who had received previous treatment with pegylated interferon and ribavirin. Fibrosis stage was determined by liver biopsy according to METAVIR score or with real-time transient elastography (FibroScan®, Echosens, Paris, France). Biochemical response was identified by normalization of transaminases. Virologic response was identified by SVR (negative HCV RNA three months after EOT). HCV RNA was measured quantitatively using semi-automated reverse-transcription polymerase chain reaction (RT-PCR; dynamic range 12 - 1,000,000 IU/mL) at the time of transplant; before the start of treatment; 1, 3, and 6 months after the start of treatment; and 3 months after EOT using semi-automated RT-PCR (IU/mL). Sofosbuvir was used in recipients with an eGFR of > 30 mL/min/1.73 m2. The ribavirin dose was adjusted between 400 and 800 mg/day, according to hemoglobin level. Erythropoietin was used for correction of anemia in cases of a hemoglobin level below 10 g/dL. Blood transfusions were performed in cases of a hemoglobin dropping below 8 g/dL despite erythropoietin administration. Granulocyte colony-stimulating factor was used in cases of a total leukocyte count of < 2,000 or an absolute neutrophil count of < 750. Thrombopoietin receptor agonist was used when available in cases of a platelet count of < 50,000. Two patients with chronic kidney disease and eGFR levels of < 30 mL/min/1.73 m2, and 5 patients who received combined sofosbuvir and simeprevir, were excluded from the study. This was an intention-to-treat prospective analysis performed on consecutive patients. In all patients, the initial immunosuppressive regimen was based on a calcineurin inhibitor, either cyclosporine or tacrolimus. In addition, patients received 500 mg of intravenous methylprednisolone after reperfusion. Starting on postoperative day 1, methylprednisolone was tapered from 200 mg to 20 mg within 5 days; thereafter, methylprednisolone was maintained at 20 mg/day, then tapered by 5 mg/month, and finally stopped at 3 months post-transplant. Tacrolimus levels were maintained at 6 - 8 ng/ml and cyclosporine at 150 - 200 ng/mL during the course of treatment. Patients were changed to everolimus (3 - 8 ng/mL) in cases of renal impairment, with a reduction in the dose of tacrolimus to a target level of 3 - 5 ng/mL or cyclosporine of 100 - 150 ng/mL. Mycophenolate mofetil was used as part of the initial triple immunosuppressive therapy or as a maintenance immunosuppressive. Basiliximab was used for induction in patients with a GFR of < 60 before the transplant. Categorical variables were expressed as percentages. Continuous variables were presented as mean ± standard deviation (std) (range: minimum and maximum). The calculations were performed with SPSS 17.0 for Windows. Thirty-nine patients were included in the study. The patient demographics are shown in Table 1. All recipients were treated after LDLT; none received treatment pre-transplant. Fibrosis stage was determined by liver biopsy according to the METAVIR score in 33 (84.6%) recipients and real-time transient elastography in 6 (15.3%) recipients. One recipient died 1 week after the start of treatment from unresolved hepatic encephalopathy, and the remaining 38 patients completed 24 weeks of treatment and were then followed for 12 weeks after EOT. SVR at week 12 after EOT was achieved in 76% (29/38) of the recipients. 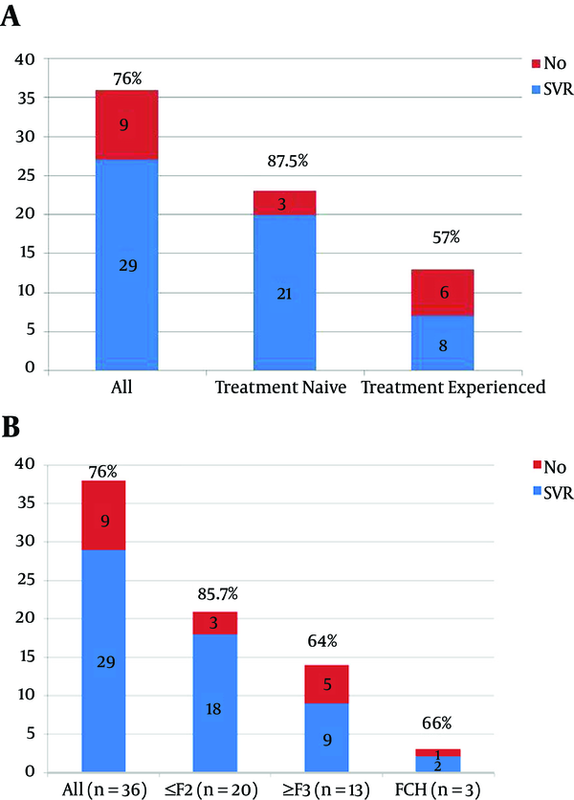 SVR was significantly higher in the treatment-naïve patients (Figure 1A) and in recipients with a low fibrosis stage (Figure 1B). Only 2 (5%) recipients developed severe pancytopenia and acute kidney injury, requiring hospital admission, blood transfusion, GCS factor, and thrombopoietin receptor agonist. These 2 patients had low creatinine clearance (36 and 45, respectively) before starting treatment. Both stopped treatment early after 4 weeks, and achieved SVR. For liver transplantation candidates, the introduction of effective and tolerable HCV direct-acting antivirals (DAAs) has led to a challenging question: Who should receive HCV therapy and how can appropriate timing be achieved? Now that HCV treatments with better tolerability and response rates are available, such treatment should be offered to all recipients post-transplant. One obvious advantage of this strategy is better SVR rates in patients with a low fibrosis stage and in treatment-naïve patients. With the availability of new, highly effective, highly tolerable DAAs, HCV treatment options for liver transplantation recipients have increased. Current guidance from the American Association for the Study of Liver Diseases and the Infectious Diseases Society of America (AASLD/IDSA) clearly identifies this population as having among the highest priority for receiving immediate HCV treatment (9). But which treatment should be administered in this setting? Hepatitis C has been very challenging to treat in the post-transplantation setting, with poorly tolerated therapies, reduced efficacy rates, and the potential for rapid or worsening progression of liver disease. The current availability of all-oral treatment options transforms how we can manage these patients, and the latest guidance from the AASLD/IDSA has outlined new management strategies for this patient population. The recommended regimen for transplantation recipients with genotype 4 HCV infections, including those with compensated cirrhosis, is 12 weeks of ledipasvir/sofosbuvir with weight-based ribavirin (10). In the SOLAR-1 trial, the response rates in transplant recipients with mild liver disease were excellent exceeding 95% suggesting that these patients can be treated similarly to patients who have not undergone liver transplantation (10). Similarly, although we used sofosbuvir and ribavirin for 6 months in our recipients, SVR was higher in those with mild liver disease and those who were treatment-naïve, but a lower SVR was achieved (suggesting better results) with ledipasvir/sofosbuvir, which is currently unavailable in Egypt. An alternative regimen for transplant recipients with genotype 1 HCV infections and who have mild liver disease (METAVIR fibrosis stage F0 - F2) is ombitasvir/paritaprevir/ritonavir plus dasabuvir and weight-based ribavirin for 24 weeks. The CORAL-1 trial evaluated a limited number of transplantation recipients without cirrhosis, and achieved excellent SVR rates (11). Although it is expected that this regimen would work just as well in transplant recipients with compensated cirrhosis, without the data, we would reserve its use for those without cirrhosis and with renal impairment, for whom we know it is safe and effective. Sofosbuvir was not safe and caused serious adverse events when used in patients with mild renal disease in our study. Although sofosbuvir and ribavirin have been recommended for treatment of HCV genotype 4 for 6 months in the non-transplant setting (12), our study proved that this regimen has a lower SVR rate in post-transplant recipients. Similarly, Charlton and colleagues reported a 70% SVR for genotype 1 after liver transplant (7). Another alternative regimen for transplant recipients with genotype 1 HCV infections, including those with compensated cirrhosis, is 12 weeks of sofosbuvir plus simeprevir, with or without weight-based ribavirin. This regimen has been evaluated in a study of 77 transplant recipients, where it achieved an SVR4 rate of 92% (13). We started to use this regimen in our patients for HCV genotype 4 and are waiting for the results. It should be mentioned that one of the non-responders in our study, who failed to achieve SVR with sofosbuvir and ribavirin after 6 months, received sofosbuvir plus simeprevir for 3 months and achieved SVR. This may be a promising treatment in the near future. With regard to patients with fibrosing cholestatic hepatitis (FCH), a rare but serious complication, although the AASLD/IDSA guidance does not address the subset of patients who develop FCH, data from the sofosbuvir compassionate-use program suggest that these patients can be successfully treated with sofosbuvir-based therapy. Out of 10 patients who developed FCH and received sofosbuvir and ribavirin with or without peginterferon, 8 achieved SVR12, and 7 of these patients remained stable long enough to see their FCH reversed (13). In our practice, we have used sofosbuvir and ribavirin without interferon in patients with FCH, which has achieved rapid suppression of the virus and improvement in bilirubin and clinical status, with an SVR of 66%. To the best of our knowledge, our study represents the largest number of HCV genotype 4 recipients with recurrent HCV after LDLT, compared to one recipient with genotype 4 in a previous study (7). Our findings argue against the use of sofosbuvir and ribavirin alone, although this is still recommended by the AASLD/IDSA. In conclusion, the timing of treatment initiation in liver transplant recipients has not been well characterized, and there is no guidance provided from the AASLD/IDSA. We recommend that hepatologists begin treatment as soon as possible after liver transplantation. We also recommend newer combinations, such as ledipasvir/sofosbuvir or sofosbuvir/simeprevir, rather than sofosbuvir with ribavirin, to achieve higher rates of SVR. We would like to thank Ahmed Mukhtar. Authors’ Contribution: Hany M. Dabbous is a transplant hepatologist and wrote the manuscript. Hany Sayed, Mohamed F. Abdelghafar, Mohamed Bahaa, and Mahmoud S. Elmeteini are transplant surgeons. Iman F. Montasser, Mohamed A. Sakr, Rasha Refai, Moataz Sayam, and Ahmed Abdelmonem collected data and followed the patients.